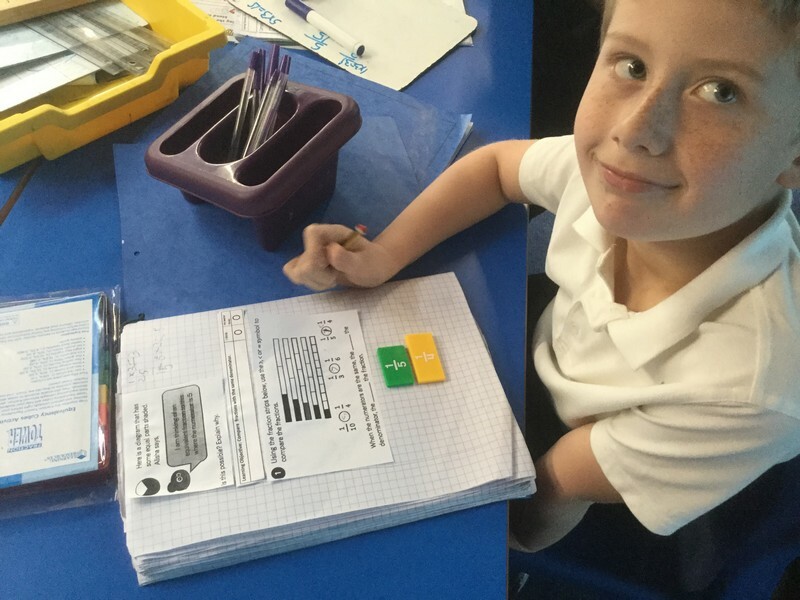 Bluebirds have been persevering with equivalent fractions today. They have used their reasoning and problem solving skills. Using practical equipment, helped children to visualise the question and check their answers! Bluebirds are really enjoying their Wednesday morning swimming lessons at the fantastic University of Birmingham swimming pool. 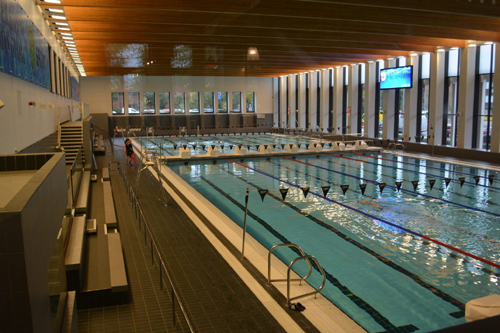 Over the next six weeks, children will participate in activities and games to build water confidence besides being taught the correct swimming strokes. Obviously, we are unable to take photos but rest assured, the children are having fun and more importantly, are learning a valuable skill, which is part of the National Curriculum. Amber – It’s good as the water is the right temperature. 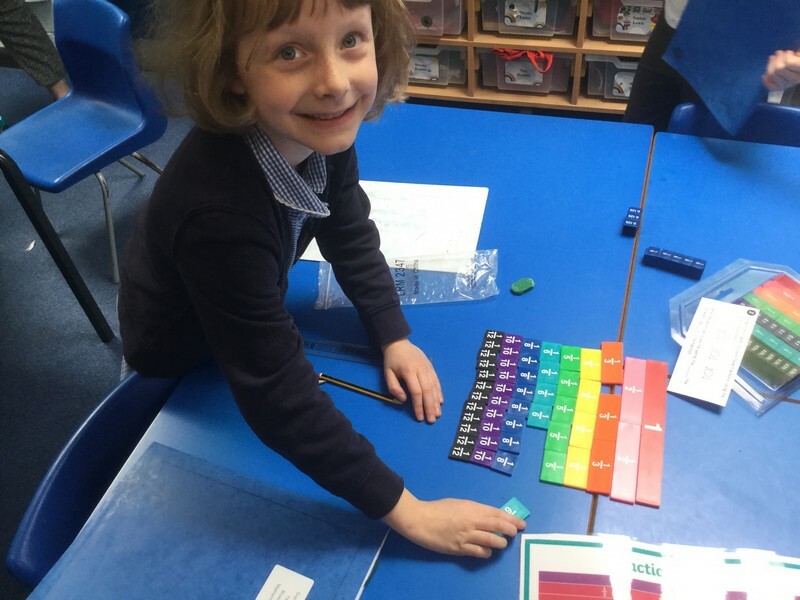 Ruby L – Its great that we can all learn to swim. Kennie – It’s exciting to do and helpful to be close by so we can go. Sophie – Helpfully, they provide arm bands and teach you new strokes. 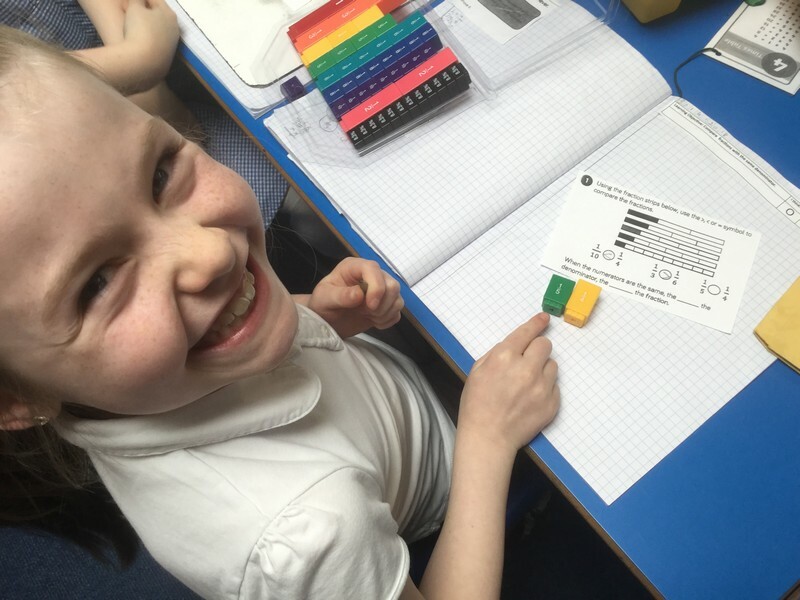 Rubi D – I want to learn something new every week. Melissa – Its a fantastic opportunity. We are lucky to go. Today, Bluebirds experienced a new activity in Guided Reading, where they took part in Karaoke Comprehension which used the song entitled “This is Me” from the recent film, The Greatest Showman. Many of the children were already familiar with the song so it was really enjoyable. The children sang along with the lyrics which they were able to answer questions about afterwards. • What is the message of the song? – Katerina explained the bearded woman knew she was unusual how she looked but she didn’t care and was proud of her self. 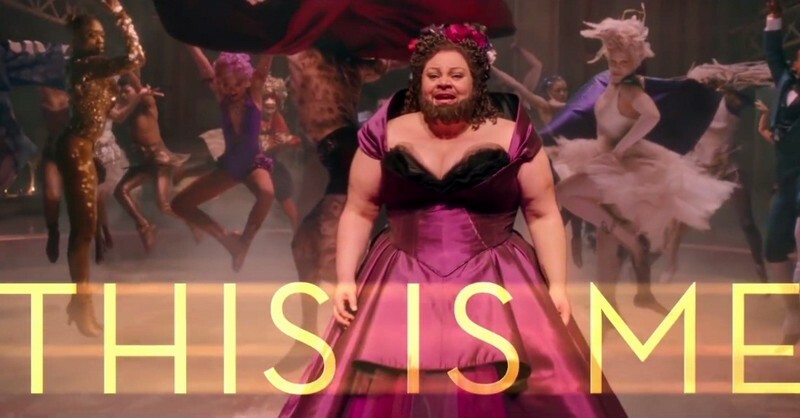 • Why do you think the title for the song is “This is Me?” – Evie explained the lady was singing about being accepted for what she was although she looked different. • What do you think the words “broken parts” and “scars” refer to? – Megan – She is hurt from what has happened in the past. It is not easy to forget when people say/do hurtful thing to you. • During the song the singer is supported by a choir. Why? Melissa – She felt scared but is brave her as other people with differences join and support her. They work together as a team. • Why does she feel ashamed? – Niah – She used to hide away. People stared at her because she was a woman with a beard. She felt awkward and embarrassed. • How does she feel about the way she is treated? Sophie – She feels unhappy and sad. Its unfair and she feels like standing up for herself. Bluebirds were eager to hear this term’s Class Reader. Mrs Parry showed the children the accompanying illustrations in the book using her visualiser. Ottoline is clever at solving mysteries and puzzles. The blurb reads……a string of daring burglaries have taken place and precious dogs are disappearing all over the town. 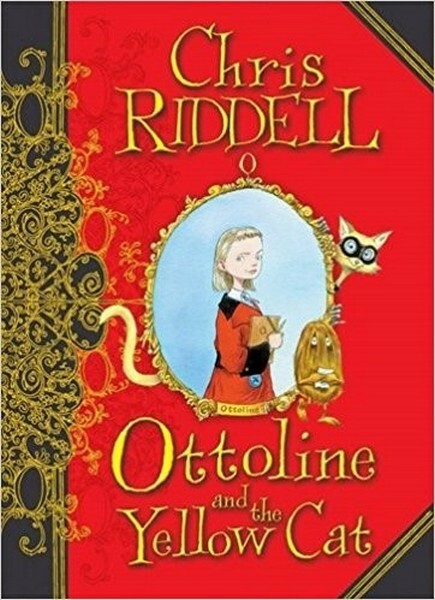 Can Ottoline and Mr Munroe come up with a clever plan to catch the robbers?! Demi – You should play games together and look after them. Kezi – You should look after your friends. Elliott – You have to be a good friend to have a good friend. Amber – You should be kind and helpful to each other. Yusif – You shoule ask someone to play with you if they are lonely. Lexi – Always stand by your friends and stick up for them. Megan – Treat friends as you wish to be treated. Sophie – Be a good listener as they may have better ideas than you. Pheobe – Help each other with things that are difficult or tricky. Brooke Ba – Look after friends if they get hurt. Katie – Keep your friends’ secrets else they won’t trust you. Be loyal. Melissa – Friends treat each other nicely and do good deeds for one another. Encourage each other. Sumaiya – A friend tells the truth and is patient. Sophia – You should be kind and respect each other. Joey – Always be honest. Brooke Be – You should have a heart and be caring. Ruby L – Don’t laugh at your friends if they are upset. Chandler – Try and make your friends laugh. Katerina – You need to be fun. Evie – Be careful with their toys and share nicely. Kennie – Be helpful to each other. 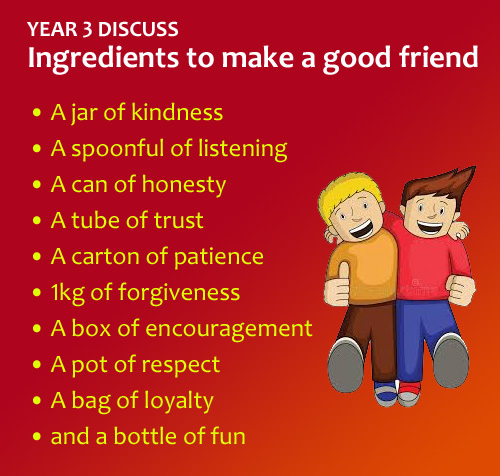 Mrs Parry gave the children a recipe to consider …… the ingredients to make a good friend!